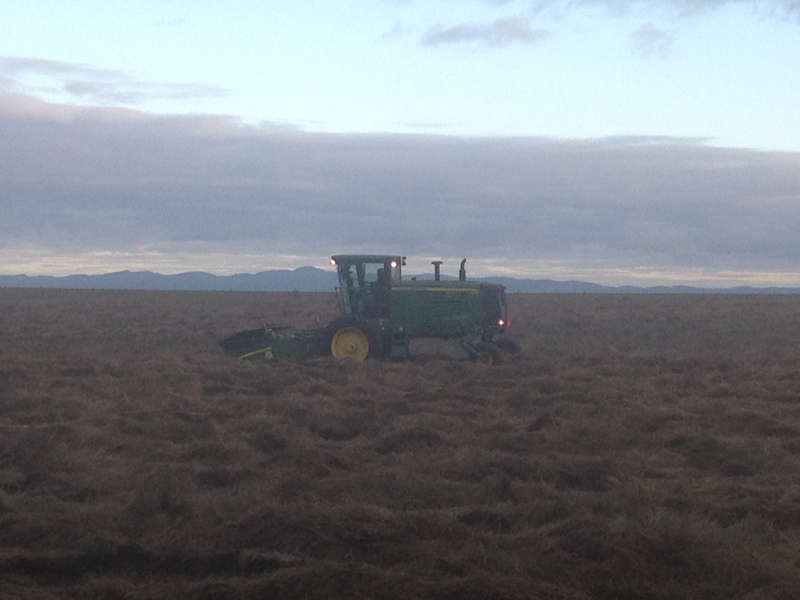 Swathing Demo…or Roller Coaster Ride?? For most farmers harvesting equipment doesn’t come cheap and it isn’t something that you buy without a “test drive”; it’s such an integral part of getting our seed crops to market that usually buying something is no small venture. So when it comes time to check out what is new and exciting in the world of seed production harvesting equipment we usually jump at the chance to try out some new toys. This week we got to demo a new swather. Maybe I should start at the beginning, seeing as many of my readers aren’t necessarily farmers. 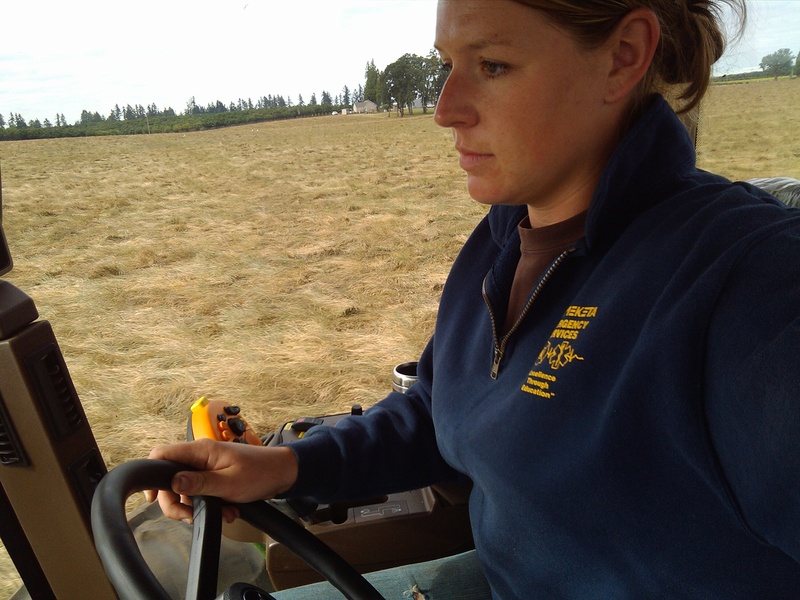 Swathing is the first step in grass seed harvest. It is basically “windrowing”, or cutting the crop into rows that can then be picked up by the combine. In the area where I live this all done through the night; with seed production it is very important that the seed stays on the straw so that it can get into the combine. So we have to cut when the dew is on the plants in order to allow the seed to not shatter, or fall off of the straw. Windrows on the left, what hasn’t been swathed on the right. We have two swathers right now that do a great job. But again, as I said, when you get the chance to try out a new piece of machinery…it’s not a question of if, more of when can I get my hands on it?! So they showed up at 4am the other morning…and I was excited! I took a few rounds as the passenger and then they gave me the wheel. After getting the hang of things…still looking quite focused! Now here is where this whole roller coaster idea comes into play. Because our swathers that we have now, run about 4mph while we’re cutting, this new machine, runs over 10!!! I agree that in a car, this seems like a snails pace. But when you’re on a machine with knives swinging around like crazy, bouncing over grass stubble, trying to drive a straight line, 10 miles an hour feels like you’re hitting the autobon at 120mph!! Plus if you’ve ever worked on a farm you know how fast things can go wrong at a mere 1.8mph on a combine, yes, multiply that stress by 5! You can say I hardly took my eyes off the windrow or my white knuckled hands off the wheel! And to tack onto that, it’s not that you’re just going fast, you’re also steering the machine from the rear tires. These babies turn on a dime, a very fast dime! I did a few cookies (ROOKIE! ), I’ll have to admit, but I think that if they would maybe let me demo it for the season (wink, wink) I would get the hang of it! 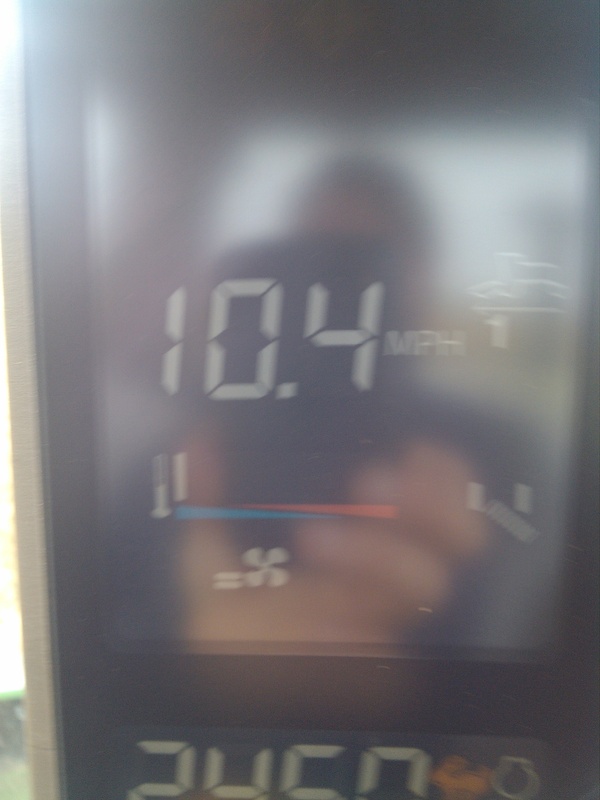 I’m not making this up…I was going 10.4!!!! 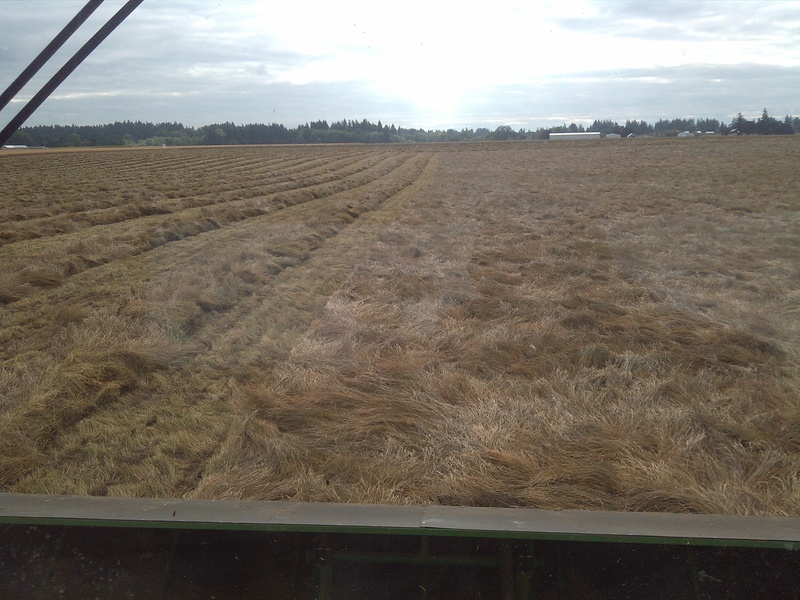 I have to say though, the machine did cut a wonderful windrow! As the first step in harvest, having a good windrow is something that can’t be overlooked. It will be interesting to see how this field combines compared to others. Personally I love demos, however getting back into my 4.0mph swather did seem a bit boring after this crazy experience. They have a good video out that shows some examples of this baby at work, pretty impressive. ← Wordless…Everything is Changing so Fast! WOW!! What wold you do with all those spare night time hours? 🙂 That’s amazingly fast. Sorry for so many posts; getting myself caught up. Well , we don’t have a new swather, but we have a new baler. Wow, what a difference! Any new equipment is always a time saver!! I love my “Indy 500” swather. We used to have 6 windrowers now we have 3 that do the same job, if not faster. We’ve had them for several years & it still blows my mind how fast they go!